Douglass was thirty-six years old when he came to Morlatton. During the 1760’s, Douglass was active in petitioning for road creation. George Douglass lived from 1726 to 1799, was a Revolutionary War veteran (fighting in the battles for Long Island as a captain in the Berks County militia) and is buried in St. Gabriel’s church yard. Douglass was an extremely wealthy man. A reference to his wealth can be found between 1781 and 1794 on tax lists because he is listed as owning one pound of silver plate. The 1795 tax list shows Douglass owning fifty ounces of silver plate. He was even taxed in 1785 for his family wagon. According to a receipt book located in the files of the Historic Preservation Trust of Berks County, a Mary Douglass spent the year 1833 collecting debts owed to her deceased husband’s store. George Douglass Jr. had died in 1833. George Douglass was a Justice of the Peace for Berks County from 1764-1776. Two important factors for the post were high local social and economic status, and potential usefulness to the Proprietary government as a local political organizer and exerter of influence for the Proprietary interest. As a Justice of the Peace in the 18th Century, George Douglass would have conducted county business from his home. Local residents would have gone there to deal with land disputes, wills, water right agreements, and probate records, as well as crime. A LOTTERY, For raising Five Hundred and Sixty two Pounds, Ten Shillings, for paying the Arrears due to a Company of Rangers, raised in Tulpehocken, in Berks County, for the Protection and Defence of the Inhabitants of that County in the late Indian War. The Occasion whereof is as follows. IN the Year 1755 the Savages entered the Frontiers of that County, scalping, burning and destroying wherever they came, with the most cruel and merciless Rage, and driving the whole Settlements before them, whereby that Part of the Province became as a Desart. To prevent the like Desolation coming into the interior Parts of the Province, 32 of the Inhabitants of Tulpehocken and Heidelberg associated and agreed to raise and pay 132 Soldiers to range on those Frontiers, for a certain Time. They were raised, and continued in that Service the Term agreed on, and the aforesaid Sum is still due to them: And altho’ the People of that and the neighbouring Counties received equal Benefit and Protection from that Service with Associators, yet no one has been king enough to contribute to defray the Expence; and Obligation therefore of paying for this real public Service rests wholly on those Associators, many of whom being in narrow contracted Circumstances, must be ruined if Suits at Law (with which they are threatened) should be brought against them. They therefore humbly beg Leave to apply to the Public, by Way of a small Lottery, for their Relief, and hope their circumstances, on this interesting Occasion, will recommend the Sale of their Tickets to all who desire to live in Peace and Safety…. In this Scheme there are not two Blanks to a Prize. The Managers appointed are, Peter Spycker, Esq; Messieurs Christian Lauer, Michael Reis, John Zerbe, Frederick Weiser , and Samuel Weiser . The Drawing will certainly begin on the 29th of January next. The Prizes will be published in this Gazette, and the Dutch Newspaper, and will be paid, (after a Deduction of 15 per Cent.) when the Drawing is finished, by the Managers, who sign the Tickets respectively. Tickets are now selling by the Managers, and by John Ross, Esq; and George Honey, in Philadelphia; Jacob Levan, Esq; in Maxatawny; George Douglas in Amity; and Henry William Steigel, at Elizabeth Furnace. In addition to the political and social positions held by Douglass, he also ran a store at his property. The store which the Douglass family ran at this location was apparently dealing with mass quantities of iron from the local ironmasters in this iron-rich region. Some letters shed light on this fact. In June 1796, David Rutter owed the Douglass’ L168 for “boating iron.” In 1801, Dewees—a local ironmaster—informed George Douglass, Jr. that he had a load of iron ready for him. That same year, Andrew Douglass, brother to George Jr., was running an iron business in Philadelphia and was in hopes that a fine parcel of iron could be sent down as he was sure there were a few tons of plates for sheet iron lying around. After George Douglass, Jr. inherited the property, he too became active in local affairs. Like his father, he was a vestryman at St. Gabriel’s from 1800 to 1806. 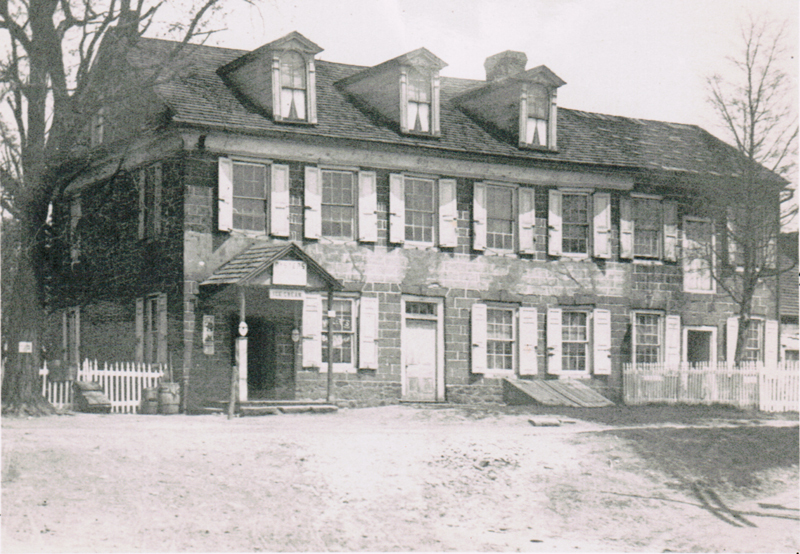 In 1829, the section of the building which once housed the store was established as the Douglassville Post Office. During the early 1900’s, the building housed a restaurant and barber shop. After purchasing the White Horse Inn, George Douglass decided to build himself a separate sandstone Georgian mansion. The two and a half story structure provided ample living space for his family. The mansion must have been one of the first full-blown Georgian structures in the region. It is a central passage, double pile, Georgian-type structure with five principle façade bays. There was a western corner entry that was a later alteration, even though it appears that the dormers are original to the structure. During a recent roof restoration, the dormers were removed and are currently stored in the attic space. The exterior consists of fine cut stone, a plaster cove cornice, and evidence of a pent roof. There is a date stone with an unusual arrangement of initials and numerals. The interior of the structure is currently in a poor state of repair and is in the process of being restored. Much of the first floor’s original woodwork has been lost. There is evidence that the first floor walls had been fully paneled. The fine corner cupboard in the southeast room is probably a Federal period addition. However, the second floor and attic retain much of their original woodwork and hardware. 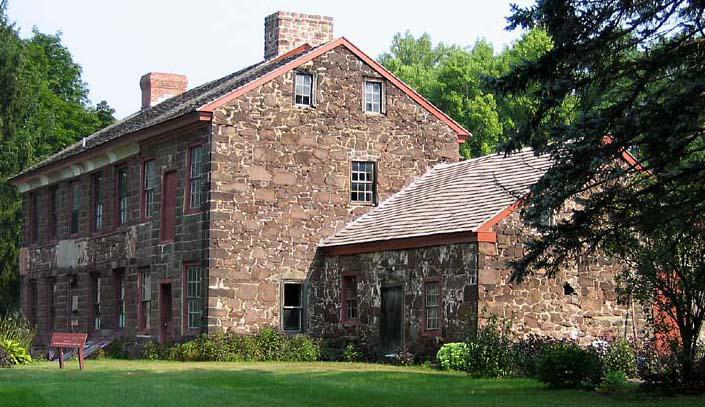 The 1799 Amity Tax List describes the property as having one stone house and one stone barn. Sometime after the Georgian period, the house was enlarged to accommodate Douglass’ general store operation, which was growing rapidly. The three-bay section to the east was added in 1834 and was probably used as the store. Also added in 1834 was the recessed rear porch. These 1834 additions were completed by George Leaf (George Douglass Jr.’s son-in-law) who was the third owner of the store enterprise. The one story section to the east of the original section of the house is very rough in construction and character. This rough section was apparently used as either a kitchen or other domestic work building. There is a small vaulted spring cellar and a chamber above that for smoking meat. It appears that this one-story section was in existence prior to the 1834 addition. There is a rarely-seen stone privy to the rear of the house which appears to be an early structure. The property would have originally been within the boundaries of Mounce Jones’ land in the early 1700’s. 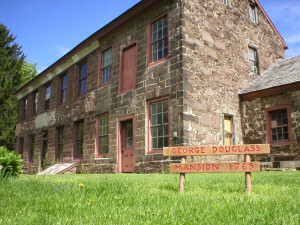 In the early 1760’s, George Douglass purchased the property and it was owned by him and his heirs until at least 1944. There is an incredible amount of tax information on Douglass. The 1765 tax list lists him with 70 acres of cultivated land, 50 acres of uncultivated land, 45 Pounds of rental income, 2 horses, 2 cattle, and he paid 4 Pounds 4 shillings of quit rent to the Proprietor. In 1767, George Douglass was listed as a shopkeeper, owned 175 acres, 1 horse, and was taxed 30 Pounds. The 1778 tax list shows Douglass with 120 acres of land (70 of which were cleared), 1 mare, 1 cattle, and paying 3 Pounds in taxes. In 1781, the tax list showed 120 acres (106 of which were in Union Township), 1 mare, and 2 cows. The 1785 tax list shows Douglass as a shopkeeper with 120 acres of land, 1 mare, and 6 cows. In 1786, he is listed as a shopkeeper with 120 acres of land, 1 mare, and 2 cows. The 1789 list has him as a storekeeper with 120 acres and 2 cows. The 1791 list has him as a storekeeper with 120 acres (100 of which were in Union Township), 1 horse, 1 mare, and 2 cows. In 1792, Douglass is listed as a storekeeper with 120 acres, 2 horses, and 2 cows. The 1794 list shows him as a storekeeper with 120 acres, 3 horses, and 2 cows. In 1795, the tax list has Douglass as a shopkeeper with 90 acres, 2 horses, and 2 cows. The 1799 list shows him as a shopkeeper with 100 acres, 2 horses, 1 mare, and 2 cattle. A Mr. Miller lived in the building during the early 1900’s, paying rent to the Douglass heirs. In 1969, the home was occupied by Edgar Webster. The Historic Preservation Trust of Berks County purchased the property in 1988 and began a ten-year restoration project. 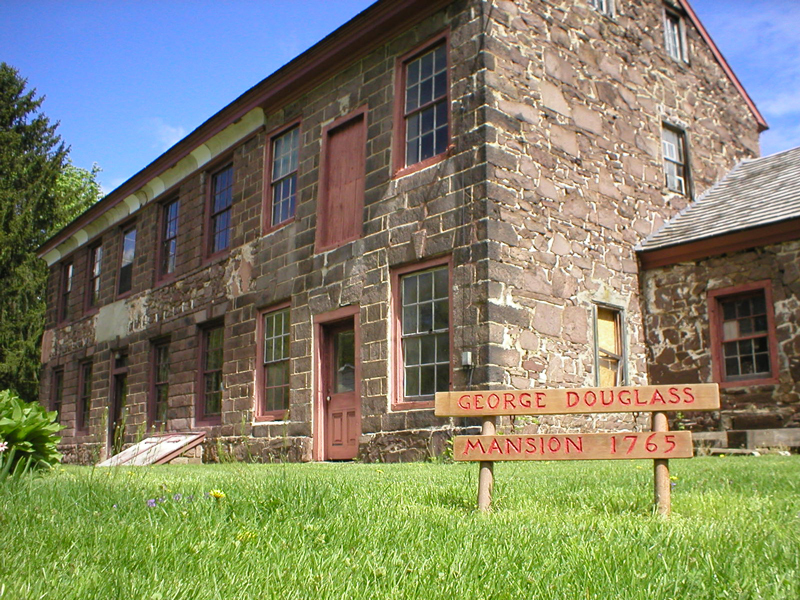 Interested in learning more about the George Douglass Mansion and the Historic Preservation Trust of Berks County? Search records, pictures, images, architectural drawings and more in our Online Archive.